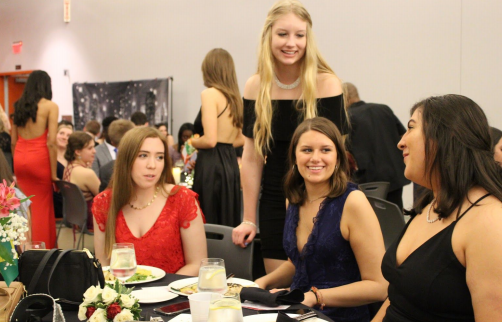 Homestead High School’s annual Prom took place at the Harley-Davidson Garage in downtown Milwaukee on April 6, 2019. Students enjoyed taking pictures, sitting down for a fancy dinner, dancing and eating from a donut bar for dessert. The theme this year was “City Nights, City Lights.” Each table had decorations that represented major cities in the world, like Hong Kong or London. View the gallery below to see how juniors and seniors enjoyed their prom night. Greer Gentges, Katelyn Bliesner, Leah Glaser, and Katie Haddad, seniors, hang out before dinner begins.